In the vein of the 250 box challenge, we also have the 250 cylinder challenge. 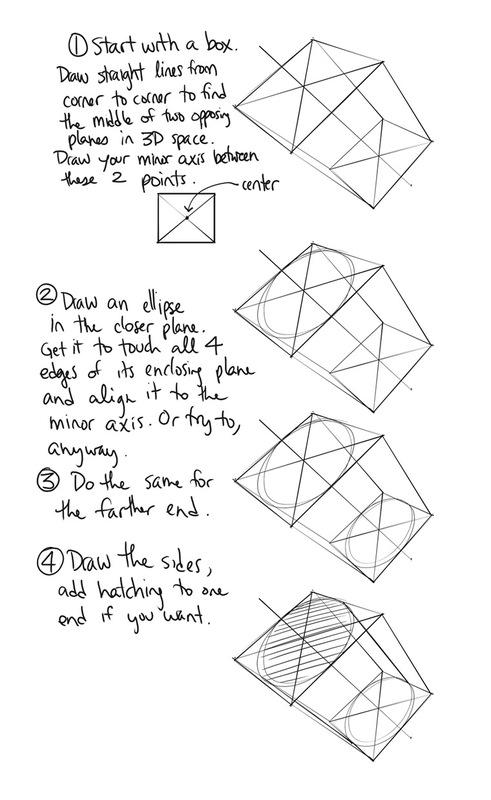 While these notes are certainly useful for the form intersections exercise, I'd recommend not doing the challenge itself until after you've completed lesson 2. Similarly to the box challenge, while the meat of the task is a matter of drawing a lot of cylinders, there are a few things I want you to keep an eye on and a methodology for checking your errors that we will be employing. 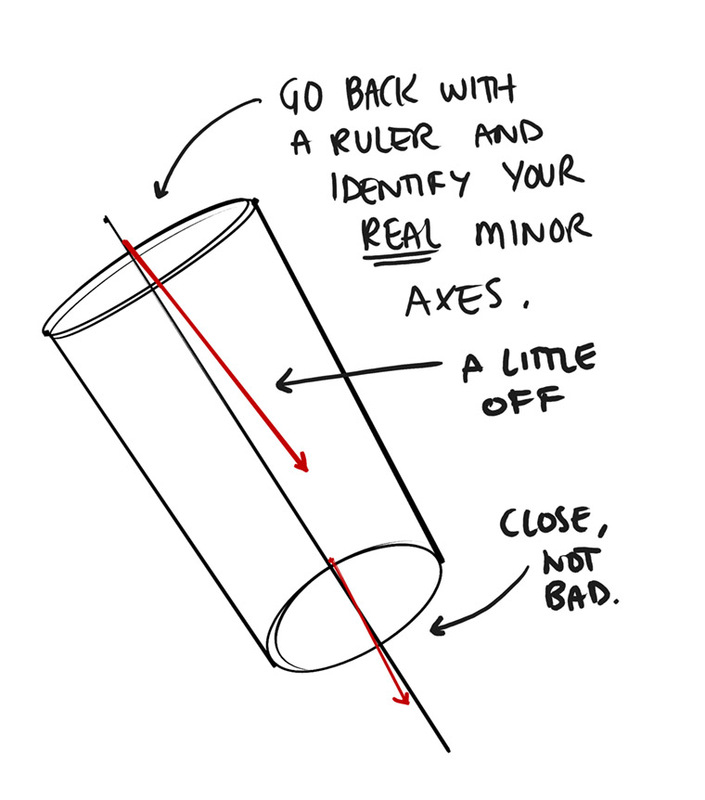 So one of the reasons we focus on cylinders enough to give them their own challenge is the concept of the minor axis. When we have a variety of cylinder-like forms (like the organic forms/sausages from lesson 2) as well as objects made up of many different cylinders (like a flower pot or a vase), the importance of having a minor axis to align to is pretty critical. Throughout this challenge, you want to really push your ability to align ellipses to an arbitrary minor axis line. Every cylinder is going to require this - one minor axis, shared by the ellipses on either end of the form. This was introduced in the organic forms exercise from lesson 2 as well. 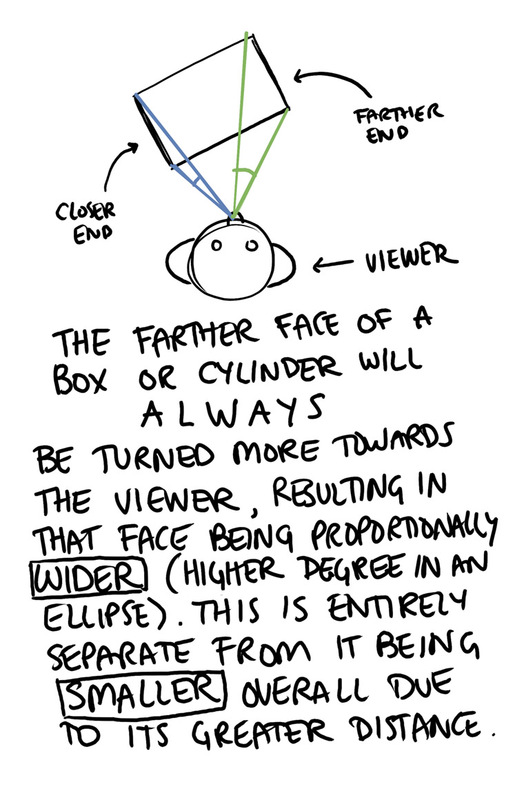 Because of the fact that the viewing angle of the two different ends of the cylinder is not the same, the farther end of the cylinder is going to have its face oriented more towards us than the closer end, meaning its degree is going to be larger. Not by a significant amount, but enough to be vaguely noticeable. While we cannot see the farther ellipse, its degree still plays a role in how that end of the cylinder is curved. Not to mention the fact that we're still going to be drawing through our forms here, meaning drawing both ellipses in their entirety. This challenge is going to be done in two different stages, which will be explained below. Both have their own focus, and their own technique for checking for mistakes. 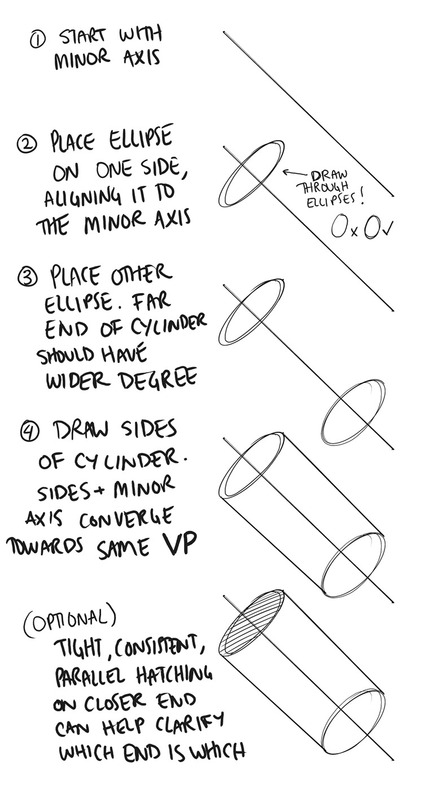 This method is a good way to start and get familiar with what's involved in drawing your ellipses such that they align to a predetermined minor axis line. We start with a minor axis line. Make it longer than the cylinder you want to draw. Use the ghosting method. Place an ellipse towards one end. Don't place it right on the end point of the line - you want the whole line to cut through it, so you have a good sense of how they relate to one another. Place the other ellipse on the opposite end. 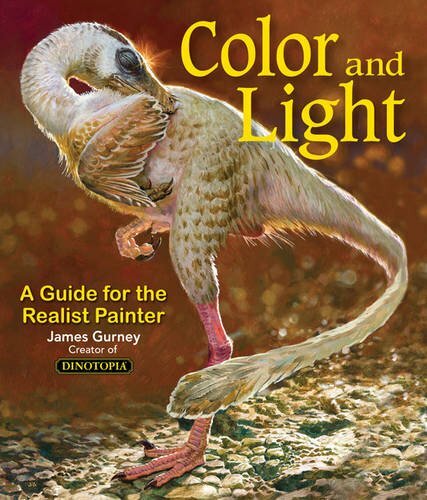 If this is the farther end, you're going to want to increase its degree slightly to account for the slight shift in viewing angle that will make the farther end orient a little more towards the viewer than the closer one. If it's the closer end, then decrease its degree a little instead. Draw the sides of the cylinder, from ellipse to ellipse. Use the ghosting method. These lines will share a vanishing point with the minor axis line. So while we're striving to keep our ellipses lined up to our initial line, obviously we're going to make mistakes. Take a ruler and a pen of a different colour and look really close at each ellipse. 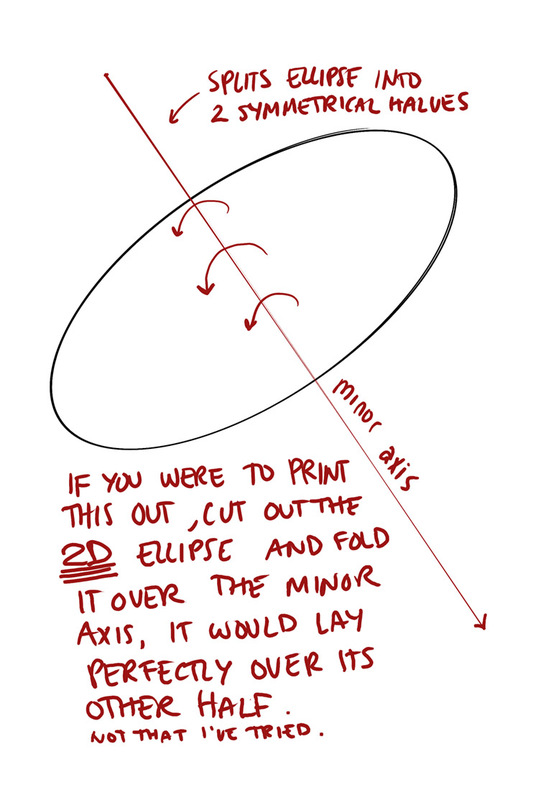 Try to ignore the minor axis line that has already been drawn, and find the real line that cuts the ellipse into two equal, symmetrical halves down its narrower dimension. Then compare this to the one you were shooting for. Being off by a little bit (like the farther ellipse in this example) isn't too bad. The closer ellipse is definitely something we'd want to work on however. Now, drawing around a minor axis is pretty straightforward, but it's still quite difficult to work with in relation to other forms in a scene. Starting with a box however gives us a big advantage - it allows us to block in the space the cylinder will occupy in a manner that is much easier to relate to other forms that may be present. Lets start with a box. 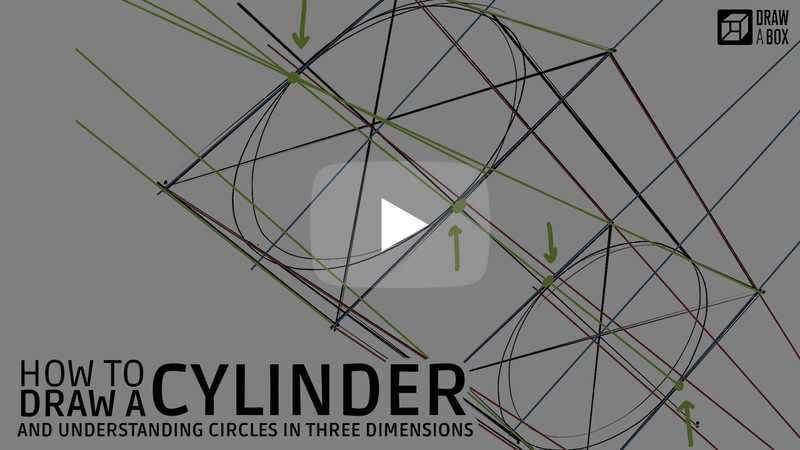 Decide how your cylinder is going to be oriented within it and choose two opposing planes in which we'll be constructing our ellipses. We can find the center (in 3D space) of each of these planes by drawing from corner to corner. The center of the plane will be where the lines of the resulting X intersect. Draw a line that passes through the centers of both planes - this will be your minor axis. Draw an ellipse in the closer end of this box. Try to get it to touch all four edges of the plane, while keeping it aligned to the minor axis. This is not easy, so be patient with yourself if you make mistakes. Do the same for the far end. Draw the sides of the cylinder - these will share a vanishing point with your minor axis line, along with the sides of the box. Similarly to how we check for errors in the 250 box challenge, we're going to be extending our lines and analyzing how they converge towards their intended vanishing points. The only difficulty here is figuring out which lines to check for the cylinder. The easiest one is just our minor axes - same as the previous checking method, find the true minor axis for each ellipse. The other two are a bit more difficult. For each ellipse, it's got four points at which it makes contact with the plane that encloses it. This is assuming that you've got your ellipse perfectly snug within its confines, and not spilling out of it or falling short. If either of these last two options are the case, you'll have to best-guess where it would have touched the edge. There's still value in this. These contact points can be grouped into pairs, as shown in this diagram. The members of a given pair will sit on opposite edges on the plane. Draw a line that passes through both members of a given pair of contact points and extend it back into space, towards its vanishing point. The VP will be the same as one of the box's other two remaining vanishing points, so you can check it directly against its lines. What makes this so much trickier than the extension method for the boxes alone is that there's a lot that could be going wrong. First off, your minor axis alignment could be off. 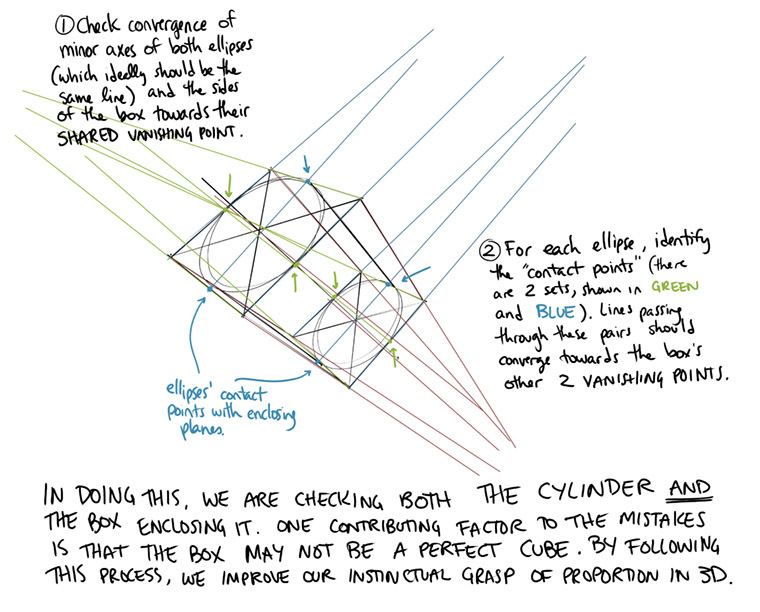 Secondly, you may not have drawn the ellipse to fit snugly within the box. Thirdly, the planes you drew your ellipses in may not really be squares in 3D space. This error checking method serves to help us work on gradually building a more intuitive sense for the proportion of these forms. 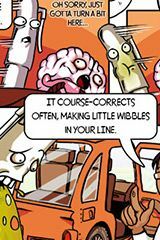 Don't get stressed if you're constantly turning up mistakes - it's entirely normal, especially with so many different factors to control. The point is to gradually get better. The truth of the matter is that for the most part, for any given drawing, you only need to be close enough. These correction methods go much farther than that, making every single error excruciatingly obvious. 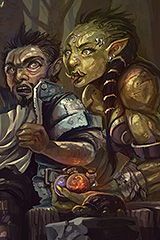 This in turn helps us learn from them a lot better, but don't think that you're going to be held to this standard in your actual drawings.